CodeWoD: How to win on, "The Price is Right"
Problem: In the popular game show, "The Price is Right," four contestants try to get nearest to the actual retail price, without going over, for a presented product. The contestant who gets closest wins the round gets to compete in a pricing game to win additional cash and prizes. What is the optimal bid strategy for each of the contestants? Is the optimal strategy commonly pursued and how can you tell? We'll get to the solution in a sec, but if you watch the show, this is one of the most exciting parts. After the first round, a new contestant joins three existing ones with the famous phrase, "Come on down, you're the next contestant on The Price is Right." An enthusiastic college student, marine, etc. comes running down, excited to play and win prizes. Then, a prize is brought out and they each try to bid and get closest without going over. The winner gets to play a pricing game, while the losers must wait and stew and try to win the next game. Let's start by doing an example where there are four bidders, in order: Alice, Bob, Candice and David. A prize is brought out -- let's say a portable jacuzzi. How much should each person bid? David thinks it is $1000. 1. The error range on price is quite high, probably +/- 30% and equal on both the high and low side. Well, Let's start with Alice: One strategy is for Alice to bid exactly $1000. This has the benefit that if she is right, she immediately wins (and even gets a bonus). However, if she is over by even $1, she immediately loses. So, there is little reason bid $1000, as she wants to be under. This logic would suggest to bid $1, however there are three more bids coming, and she must assume that they will not be wildly off on the price and they will act rationally. So, Alice must be under, but in a range that she thinks: 1) will not go over, and 2) will be close enough so that future bidders will either be under, to which she is indifferent or future bidders will go over the actual price. Alice should keep a tight range, but go lower than her actual price. A good suggestion for Alice would be to bid $900-$950. Let's say $950. Now comes bidder #2, Bob. Bob is faced with a few options. He may think his price is over Alice's, or it may be under Alice's. If his desired price is over Alice, his optimal strategy would be to bid $1 over Alice. If he bids anything more than $1 over Alice, he is essentially giving up range in which he can win. And, he is no worse off that someone in the future may bid $1 over him, because that can happen at whatever price he chooses. If he believes that the price is under Alice's he then wants to bid enough under Alice to maximize his range, but not so low that he is likely to be pipped (or have someone bid $1 more than he). So, let's say $750 for Bob. Bob now owns the range $750-950 and Alice $950+. Now, Candice must choose knowing that only one bidder, David, is coming after her. She actually has a very simple choice to make. As the third bidder, she must choose if she believe the product's price is either: 1) below the lowest bid, 2) between the two bids, or 3) higher than the higher bid. In each scenario, she would seek to maximize her chance within the range. As she knows that David will choose his range optimally, she knows that he will bid $1 over the lowest number that gets him into his range. So, she simply wants to guess the correct range and hope that David disagrees. Scenario 1 -- Candice thinks the price is below lowest bid: bid $1. Scenario 3 -- Candice thinks the price is higher than the highest bid (e.g., $950): Bid $1 more than the highest bid: $951. In this case, Candice should bid $951. David's strategy is almost identical to Candice's. He looks for the range of bids that he thinks the bid is in, and should bid $1 more than that bid. In this case, David believes the price is $1000 and the outstanding bids are: $750, $950 and $951. In this case, David should bid $952. So, the ideal bid strategy depends upon you location. If you are fist, you should go under, but close enough that your price is not so low you're likely to have a range so big that someone bids $1 more than you. If you are second, it is a similar concern, but you need to account for the first bid so that you are in your desired range. Third and fourth bid are automatic about maximizing your range by bidding $1 more than the floor of your range. In fact, the results show that people very rarely do this. If they did, you would see many more bids which were $1 higher than someone else's and many more bids of $1. While you do see these, you do not see them to the extent you would expect: at least two such bids per game and always by the third and fourth bidders. Some people just have challenges too with this game. 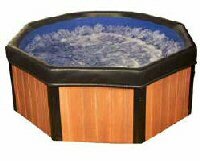 Oh, and the actual retail price of the hot tub in in pic 1 is: $899. So, Bob wins in this case.